Traveling to Wakayama’s most spectacular remote areas can definitely take time, in some cases up to 3 or 4 hours. More than 80 percent mountains, the Kii Peninsula's main access routes (rail and highway) are located along the coast. Learn here what travel options are available to help you get around smoothly to discover Wakayama. 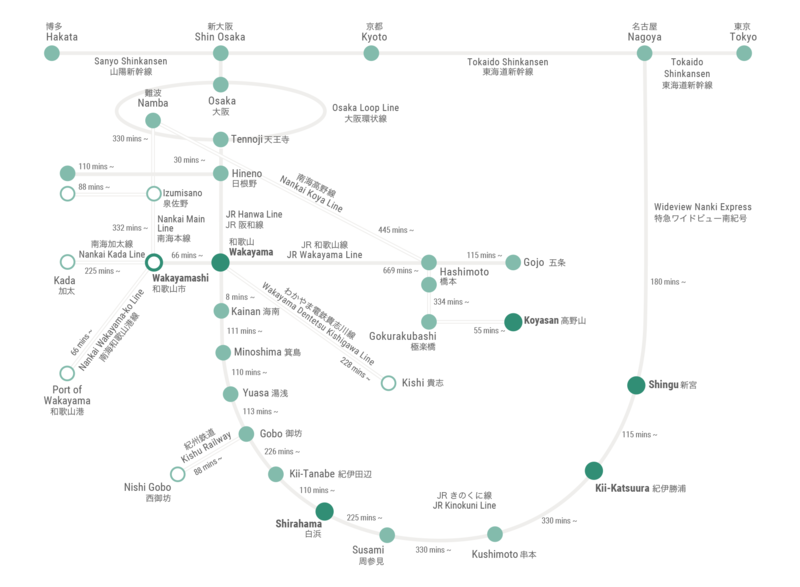 Rail service originating out of western Kansai to Wakayama is covered by two main companies. Japan Railway West (JR West: Kyoto/Nara/Osaka) operates 4 lines (Hanwa, Wakayama, Kishu, Kisei/Kinokuni) and Nankai Denki Tetsudo (Nankai Electric Railway: Osaka) runs 2 lines (Main, Koya). 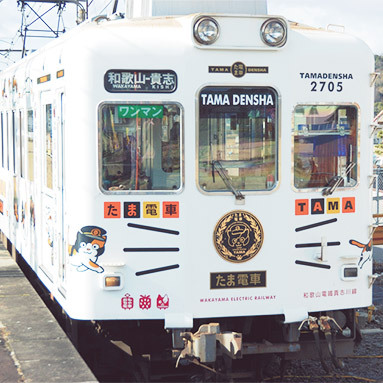 In addition, Wakayama Dentetsu (Wakayama Electric Railway) offers service between Wakayama City and Kishi on the Kishigawa Line. These train companies operate out of two separate stations 6 minutes apart from one another. Japan Railway lines and Wakayama Dentetsu connect to JR Wakayama Station, and Nankai Denki Tetsudo to Wakayama-shi Station. To help you plan your itinerary, and get your bearings, the Wakayama Traffic Navigation site offers route and map-based searches, for trains, buses as well as for major sightseeing locations. Learn more about the various train passes and great deals mentioned below, in the Travel to Wakayama section. To access Wakayama’s coastal towns, use the Kisei Mainline (also known as the Kinokuni line) which provides both local and limited express train service to Shingu – the last stop in eastern Wakayama before entering Mie Prefecture. The Kuroshio Limited Express train, originating out of both Kyoto and Shin-Osaka stations, operates on this line. As the express train ride from Wakayama to Shingu alone takes about 3 hours, opt for a right-hand side seat to enjoy the best views of the Kii Peninsula coastline and scenery. Note that more Kuroshio trains originate out of Osaka than Kyoto, and not all trains go all the way to Shingu. It is advisable to check JR West timetables, to avoid arriving at your destination too late. The Japan Rail Pass (country-wide) covers this region, along with a select few JR West Passes, such as the Kansai WIDE Area Pass. Travelers coming from either Nagoya airport or from Tokyo and heading directly to Kumano can benefit from shortened train travel times by routing via Nagoya City. 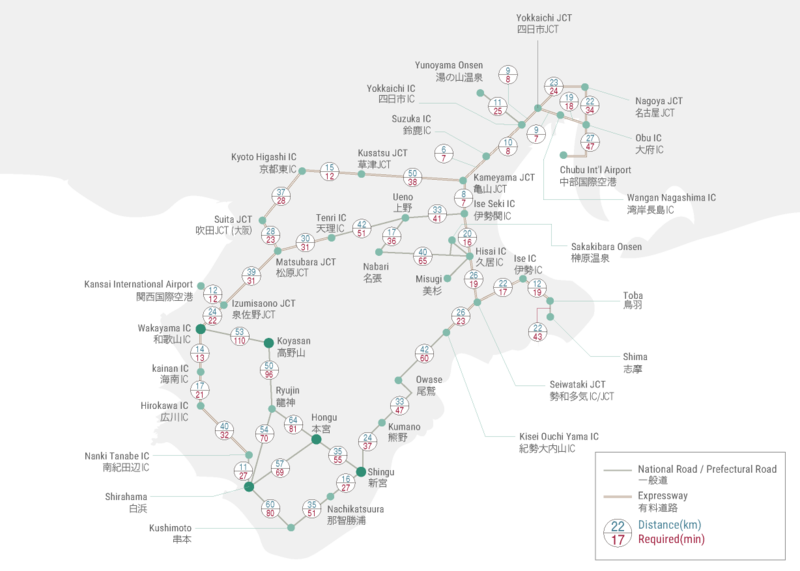 The eastern Kii Peninsula is serviced by JR Central, which offers both local and limited express service along the Kisei Main and Kansai lines, with a segment on the private Ise Railway. The JR Wideview Nanki Express train runs between Nagoya, Shingu and Kii-Katsuura and takes about 3 1/2 to 4 hours respectively. The carriage at the front of the train offers the best view of the scenic rural landscape and Pacific Ocean vista along the Ise Peninsula. Check out the Ise-Kumano Area pass, which offers a great deal on unlimited bus and train travel in this area. It must, however, be purchased prior to entering Japan. Koyasan only has one direct line, the Nankai Koya originating from Osaka’s Namba Station. Passengers traveling from Wakayama City can access this line by transferring from the JR Wakayama line at Hashimoto Station. Along with local service, handy express trains shorten travel times. The limited express service, the quickest of all services, takes only 80 mins from Namba Station and operates four times daily on weekdays, with more options on weekends. Nankai offers a discounted travel pass, covering the limited express service, the Koyasan World Heritage Ticket. In major cities, such as is in Kyoto, Osaka and Nagoya, peak hours are 7:30 - 9:30 a.m. and 5:00 - 8:00 p.m. when train stations are highly congested, and not easy to navigate. Ekiben, the boxed meals sold at stations and on trains are part of the charm of train travel in Japan. Locals make sure to leave enough time to peruse and purchase regionally-inspired lunch boxes before boarding long-distance trains. Follow suit, you will discover that from packaging, to food design and ingredients, eating is part of the fun of the train system in Japan. Across Japan, an Integrated Smart Card (IC) system allows travelers to pay for transportation fares regardless of region and service provider. For travel within Kansai’s main areas, which includes travel up to Wakayama and Koyasan (but not beyond), a handy option, is to purchase a prepaid e-money card which can be used for transport on subways, private railways and buses. Fares are automatically calculated and deducted from the deposited card balance when the card is tapped on a fare reader. IC cards can also be used for making purchases at various convenience stores and retailers, including vending machine purchases on train station platforms. There are 10 regionally-issued IC cards, they can be used interchangeably across all regions with a few exceptions. In Kansai, JR West offers the rechargeable ICOCA smart card sold at ticket-vending machines and ticket counters. It can be used on various private lines, including Japan Railway and Nankai Electric Railway. Please refer to the JNTO site for more info on IC cards. Train passes offer significant discounts for international visitors, and are well worth looking into. Along with standard plans, special offers are available from time to time. Look for the best plans covering Wakayama travel, with Japan Railway (Group, West and Central) and Nankai Denki Tetsudo. Though markedly more expensive, for passengers opting to travel without a rail pass, when unsure about the fare cost, the easiest option is to purchase the cheapest ticket. After arriving at your destination, the difference in fare can be calculated either at the fare adjustment machines near the exit turnstiles, or by a wicket attendant without penalty charges. However, in the case of limited express trains (such as the Kuroshio) a surcharge above the base fare is required. If you have not prepaid this surcharge, you can do so on the train when the conductor comes to check tickets without a penalty charge. A variety of bus lines/companies service Wakayama prefecture; from airport transfers, to regional bus lines and express/charter services between key areas such as Kii-Tanabe, the Shirahama Onsen area, the Kumano Kodo region, Koyasan, Shingu and Nara. From time to time, special passes are also available. Wakayama City area is serviced by Wakayama Bus line. Passengers carrying a valid ‘Kansai Thru Pass’ can use this on local city buses. The bus line also offers day passes for unlimited rides. The system however is not geared for non-Japanese speakers, with signage and information typically only available in Japanese. For travel in southern Wakayama, operators covering the stretch between the coastal Shirahama Onsen area and connecting through to the Kumano Kodo region via Wakayama's inland area, and then down to Kushimoto via Shingu include: Kumano Bus, Meiko Bus, Nara Kotsu. Between Kii-Tanabe and the northern area of Koyasan, the Ryujin and Nankai Rinkan bus lines operate, with the latter also providing local service in the Koyasan area. To access the Kumano Kodo area, from Kii-Tanabe to Kumano Hongu Taisha, travel time takes approximately 2 h on the Ryujin Bus service. Kumano Hongu Taisha is also accessible directly from the Shirahama Onsen area on the Meiko Bus line and takes approximately 1 h 10 min. This line also connects to the coastal city of Shingu, taking about 1 h 15 min. No reservations are required to ride the Meiko Bus rapid service between the Shirahama Onsen area and Shingu. Nara Kotsu offers bus service which connects Shingu, Kumano Hongu Taisha and Gojo in Nara Prefecture, north of Wakayama. The service from Shingu to Kumano Taisha takes approximately 1 h 15 min, and the onward journey from there to Gojo is an additional 3h 50 min. Enter through the rear door and take a ticket. To request a stop, press one of the lit-up buttons located throughout the bus. Fares are calculated by distance traveled, so match the number on your ticket to the fare information displayed on the electronic chart at the front of the bus. 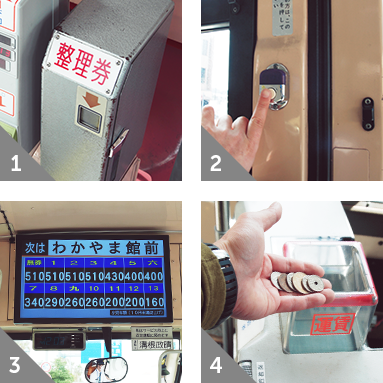 If you have the exact change, you can put it directly into the box next to the driver, or you can use the change machine to change ¥1,000 bills where necessary. The driver will help you. Various companies provide express highway bus service connecting Wakayama’s main cities (Wakayama City, Shirahama, Shingu) to Osaka, Tokyo and Nara. They offer a budget alternative for passengers who do not mind taking an overnight bus. Some lines and operators such as the Meiko Bus service between Osaka and Shirahama run several times a day. Meiko Bus offers express service between Osaka and Shirahama, making several stops along the way including at Tanabe Station. Fares are very reasonably priced, and the journey takes about 3 h 40 mins depending on traffic. This bus line also provides service between Wakayama City and Shirahama, and can be accessed from both the JR Wakayama and Nankai Wakayama-shi Stations. Advance reservations are required, call ahead to book your seat then pay before you travel. Their call center operates in Japanese, however local tourist offices provide language assistance. 1. Enter buses from the back and take a numbered ticket if available. 2. Press the stop button when approaching your destination. 3. Fares are displayed on an electronic chart. Check the number of your ticket against it. 4. The exact amount must be paid into the fare box. Use the money changer if necessary. Trekking all or part of the Nakahechi section of the Kumano Kodo Pilgrimage Route? Make use of this detailed bus map for easy and convenient access points. The Kumano Kodo Nakahechi Access Map highlights all the relevant bus stops near the Nakahechi route as well as a How To Ride guide for stress-free travel. In urban centers taxi ranks are typically found at hotels, train stations and airports but they can also be hailed from the street. Vacant taxis display the red-lit characters 空車 (kuusha or ""empty car"") in their front windscreen. In rural areas, taxis will have to be called in advance, as it is unlikely that you will find one on the street. Ask your hotel concierge to assist you in arranging a taxi. Most drivers will only be able to speak in Japanese, so having the address of your destination written down with a telephone number is advisable, particularly when heading off the beaten path. In Japan taxis operate by meter, and carry up to 4 adult passengers. The left rear door opens and closes automatically for the passenger to enter and exit. Credit cards are accepted in major cities, but keep cash on hand for more remote areas. Tipping is not customary. 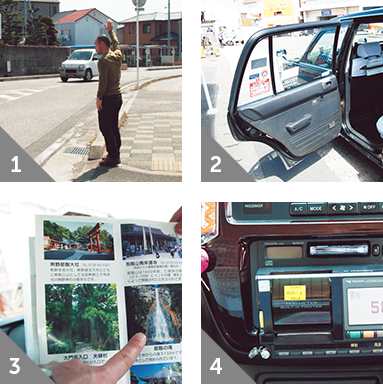 In places such as Wakayama City and Shirahama, some operators provide flat-rate and fixed time packages for travelers wishing to see the sites accompanied by a personal driver. This can be a convenient alternative to public transportation, where wait times for connections are likely. To find out if the city you are visiting has these types of packages, visit or contact the nearest tourist office. They will also be able to assist you in communicating with taxi operators who will likely only speak Japanese. 1. To hail a taxi, simply wave your hand. Taxis can often also be found outside stations. 2. Note that taxi doors in Japan are automatically operated. 3. Get in and tell the driver where you want to go. Use visual aids such as maps and guidebooks if necessary. 4. Once at your destination, pay the fare shown on the taximeter. Credit cards are sometimes accepted. 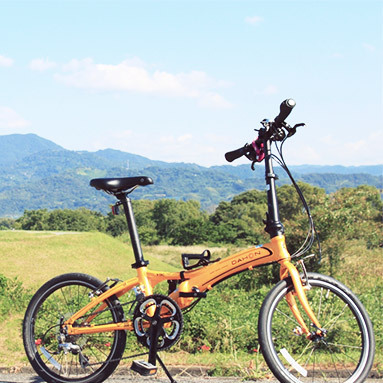 Bicycles are ubiquitous in Japan, and a common way for local residents to get around. You will notice that cyclists are allowed to share the sidewalk with pedestrians, and few cycle on roads. On a sunny day, the flat 45 min ride from Wakayama City center to Marina City is a pleasant way to spend an afternoon, and an alternative way to discover the sites. Look out for battery-assisted and conventional bicycle rental services typically located near train stations and information centers. Some even offer recommended cycling routes. Remember to park your bicycle in the appropriate designated areas, to avoid having it moved or taken away. And do ask for a safety-seat if you are traveling with children. One of the great charms of Wakayama is that it is still largely rural and unspoilt. Whilst rail and bus lines do indeed service the region, services can tend to operate infrequently compared to the hyper-convenience of transport in Japan’s urban centers. However, a good alternative is getting behind the wheel, and setting your own pace. Driving in Wakayama can be highly rewarding as you will be able to access all the idyllic countryside views, winding mountain roads dotted with hot springs, historical sites and breathtaking ocean views. The prefecture is connected by a network of expressways, highways and regional roads with plenty of full-service rest stops (michi-no-eki). Cars can be rented at major airports and in city centers. Make sure to book in advance, to ensure that you get access to a multi-language GPS navigation system. Don’t forget to download the ‘Wakayama Drive Around’ guidebook which also lists MAPCODE GPS settings for key destinations. Transportation providers in Japan take into account that travel costs for families quickly add-up, and so children under the age of 12 get to travel for half the adult fare, whether you use a rail pass or a normal fare ticket. Infants and babies do not pay anything up to two infants per adult, unless you use a reserved or Green Car seat. A child fare will apply from the third infant. When renting a vehicle, car safety seats are usually available on request. Highways and expressways typically have rest stops (michi-no-eki) located at 50 km intervals, which have restroom facilities, restaurants and play areas. And if you decide to do a bit of sightseeing by bicycle, look out for rental shops generally located close to main train stations, or at local tourist offices, and ask if safety seats and helmets are provided.